A simple, lightweight, and compatible alternative to conventional fast travel. Use a motorcycle to get around the Wasteland! Sorry, but I will not give permission for my mods to be translated, so don't bother asking. Added a marker to the most recently used vehicle. It is visible on the map, and is identical to those used by companions. Fixed the vehicle summon script so NVAC doesn't need to intervene. 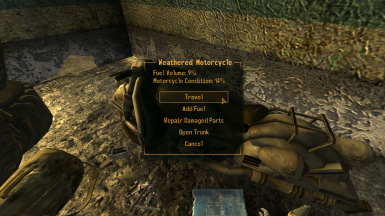 Mojave Travel disables the game's conventional fast travel mechanic, and makes it so you must instead use a vehicle in order to initiate travel. The new system was designed to be as lightweight, usable, and compatible as possible. 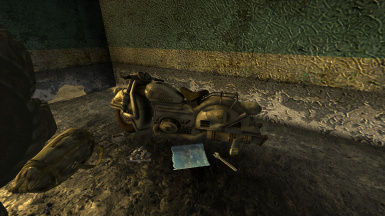 Your very own motorcycle (and it's ill-fated late owner) can be found in the abandoned gas station, in Primm. Initiating travel is done by using the appropriate option from the motorcycle engine. Before you do so, it might be a good idea to check you have fuel first - you aint going anywhere on empty! After pressing the button, your pipboy map will be brought up, and you'll be prompted to select a destination. Simply select a destination as usual and away you go. After arriving at your destination, simply walk a few paces forward and your motorcycle will be beside you. Travelling will consume fuel and degrade your motorcycle, so you will need to periodically repair and refuel it. Both condition degradation and fuel use are proportional to the distance travelled. A motorcycle in poor condition will be less fuel efficient, so it's best to maintain your motorcycle whenever possible in order to reduce your fuel consumption. To repair the motorcycle you have to use replacement parts. These are: Gas Tank, Handbrake, Conductor, Fission Battery, Scrap Metal, Scrap Electronics, Wonderglue, and Duct Tape (this information is all available in-game). Each part will improve condition by a different amount, and moreover, they each scale differently with repair skill. Try experimenting with the repair feature to find the most effective parts! Refueling requires gasoline, which can be crafted at a campfire or found randomly in the wasteland - either as loot or for sale. When crafted, the Motorcycle Transponder can be used to summon your motorcycle to the nearest discovered location, in exchange for caps. This counters a common problem I find with fast travel replacement mods, which is becoming isolated from any means of travel. For instance: I haven't discovered Freeside yet, so I walk from Novac - where my motorcycle is - to Freeside. To get my motorcycle to Freeside now, I must walk all the way back to Novac and then use it to fast travel back to Freeside - a tedious process since I've literally just walked the same route. Instead the transponder can be used to summon the motorcycle to Freeside, and I can continue to actually play the game. If you find my implementation unrealistic or not immersive - tough. It's minimal, unintrusive, and works fine. It also works between world spaces, so you can potentially call your motorcycle to the Zion Canyon, etc, if you want to use it there. This is not allowed in some worldspaces, however, so no - you can't bypass the item confiscation in Dead Money. Obviously, I can't account for every possibility relating to mod-added worldspaces and all that jazz so; use it sensibly, yeah? Before uninstalling, make sure you remove all items from the motorcycle's trunk. After uninstalling the mod, you will need to re-enable vanilla fast travel using the console command EnableFastTravel 1. Aside from these stipulations, this mod will have no permanent effects on your game and can be uninstalled at any time. Using a timescale lower than the default of 30 will reduce your travel times. This has no affect on the mod functionality or fuel consumption but you may commonly see that notification after you travel reports your travel time as "0 Hour(s)", due to it rounding to the nearest hour. After travelling, the motorcycle is placed at the point of the player's arrival marker, as defined in the GECK. Some of these are slightly above or below the ground, so there may be a few locations where your motorcycle is floating or merged into the ground a tad. Simply bump into it, hit it, or shoot it to cause it to settle. The worst offender in the vanilla game is the 188 Trading Post: the marker here is actually 12 or so feet in the air (how Obsidian?). I fixed this instance as it is by far the most noticeable - I've never seen any others above a foot so it's not really worth changing them. There is a short period after fast travelling, during which you will be unable to move. Common sense dictates not to fast travel directly into somewhere where you know you'll be shot at. A new container to be linked to the activator reference, if you want the vehicle to have unique storage (or just use the same container as the original if you wish). For the script, the only critical parts are that it must have a variable named "iFuel" and a another named "iCondition", and obviously it must call the correct quest when initiating travel. The rest can be pretty freely modified. I spend a lot of time creating and supporting my mods, so any donations are gratefully received.